On July 6th, 2018, SIX, the owner and operator of the Swiss stock exchange, revealed plans to launch a fully regulated cryptocurrency exchange. Its announcement signals a strong endorsement from one of the world’s premier financial hubs and continues the trend of Switzerland being at the forefront of cryptocurrency innovation. Unlike many countries unsure what to do about cryptocurrencies, Switzerland quickly identified the potential of blockchain ledgers and embraced the new technology with clear regulations, business-friendly laws, and a supportive government. In January 2018, Johann Schneider-Ammann, the Swiss economics minister, stated that Switzerland wants “to be a crypto nation,” and thus far, it has lived up to his declaration. Switzerland’s crypto-friendly approach made it popular amongst blockchain companies. 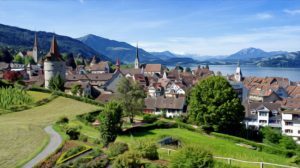 Zug, a small town outside of Switzerland’s biggest city Zurich, gained the reputation of being known as “Crypto Valley,” and as of March 15th, Switzerland was responsible for 58% of Europe’s blockchain related funding. Some notable ICOs based in Switzerland include Tezos, Bancor, DAO, and Status. In their ICOs, the four companies raised $238 million, $156 million, $142 million and $95 million, respectively. The marriage between Switzerland and burgeoning cryptocurrency companies makes sense for the parties involved. For companies, Switzerland provides clear regulations, political stability and a history of a world-renowned financial system. For Switzerland, quickly adopting cryptocurrencies can ensure it remains a major player in the financial world. On left: The top five crypto exchanges in the world make a hefty profit. Profits could increase even more with mass adoption. 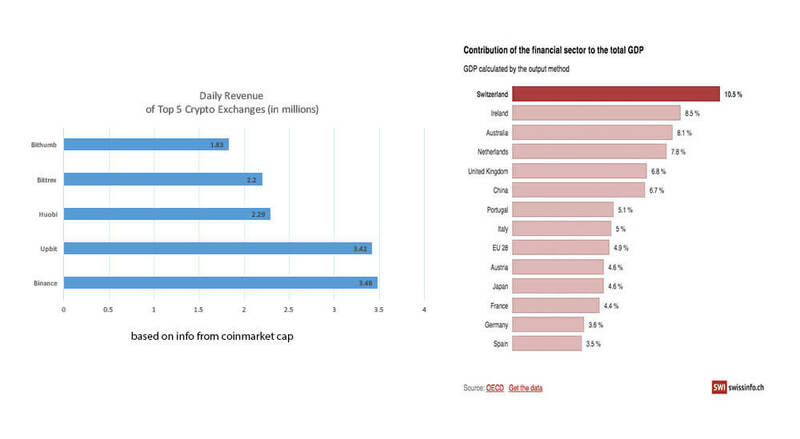 On right: The financial sector is clearly very important to Switzerland’s economy. Expected to be open by the first half of 2019, the SIX Digital Exchange will be overseen by the Swiss national bank and Swiss regulator FINMA. In addition to offering for end-to-end trading, settlement, and custody services for bitcoin, it also plans to do the same for ICO tokens. One key issue to solve before the launch is the problem of digital asset custody. Securing user’s cryptocurrencies from hackers has notoriously been troublesome. Many of the greatest digital heists came at the expense of those who left their crypto in the custody of exchanges. While many crypto-enthusiasts prefer to practice holding their own private keys and keeping their assets off exchanges, mainstream adoption may require an easier but secure way of holding own’s assets. With the backing of the Swiss National Bank and a legacy of legendary banking services, SIX certainly has the infrastructure to succeed.